We strive to ensure that our products meet the highest quality standards. Optical and mechanical components of our microscopes are frequently inspected prior to shipment. Our microscopes are durably built to withstand continuous student use. With proper maintenance and care, a (quality) microscope can last up to 15 years or more. Compound microscopes are commonly used to observe 2-dimensional images on the thin section of glass slides. Magnification ranges from 40x to 1000x, providing ideal viewing for micro-specimens like cells or bacteria. Stereo microscopes are commonly used to view 3-dimensional images. Magnification ranges from 10X-40X, providing ideal viewing when observing larger objects such as rocks, insects, small water organisms, etc. An advanced microscope is a great investment for the scientifically inclined child. A quality advanced microscope will be sure to last throughout the entirety of your child’s education. Don’t be afraid to buy a microscope that is slightly above their present capabilities. This will encourage them to far surpass their present knowledge and understanding. It will also help you to avoid multiple microscope purchases in the future! For children at the elementary school level it is also recommended to choose microscopes with a round and adjustable stage. The round 3.5” movable stage rotates 360° making it simple for children to control the slide themselves. A built in 0.65 N.A. condenser with a 5-hole aperture disk diaphragm is available on microscopes by incorporating a triple nosepiece (4X, 10X and 40X objectives). Take note that some elementary microscopes do not include a built in condenser. This results in smaller, non-standard objective lenses being used. Microscope models with a quadruple nosepiece (4X, 10X, 40X and 100X) come equipped with a 1.25 N.A .Abbe condenser with iris diaphragm. An iris diaphragm allows for an infinite number of settings compared with the set amount of setting on a 5-hole disk diaphragm. Use of a diaphragm allows the user to balance resolution and contrast of the observed specimen. A condenser consists of a series of lenses that focus light onto the observed specimen. It is vertically controlled by a knob on the side of the microscope. By properly adjusting the condenser, you can greatly improve the clarity of the observed specimen. Condensers can be either fixed mounted underneath stage for low power (0.65 N.A.) or spiral mounted for high power (1.25 N.A.). High power (1.25 N.A.) can either be spiral mounted or a rack and pinion focus. LED vs. Tungsten (halogen) - Is LED a better choice? At Vision Scientific we are always striving to provide quality microscopes with up-to-date features, LED Illumination being one of those features. 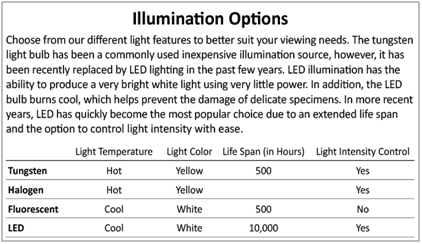 Aside from the superior crispness and clarity of the white color that’s emitted, LED Illumination also generates far less heat than traditional tungsten bulbs. The low amount of heat being produced from the bulb will assist in preserving the condition of specimens being viewed. It will also help prevent further damage to internal parts of the microscope caused by excessive heat. LED bulbs require a much smaller amount of power than traditional tungsten bulbs. The average LED bulb has an estimated 10 000 to 60 000 hour lifespan, whereas the average tungsten bulb lasts for approximately 100 hours. A microscope with a monocular head is the most economical choice. The single- head -view offers one eyepiece. This type of microscope is commonly used in elementary and high schools. A microscope with a binocular head offers greater comfort. With two eyepieces, it reduces eye strain significantly. A microscope with a 45°dual view head has two eyes pieces set at a 45°angle, allowing two children to comfortably view at the same time, or one eyepiece can also be used to attach a digital camera. Stage clip link requires only one hand to lift both stage clips, allowing for easy positioning and removal of delicate slides.